Modern food toys vs the toys of our youth. Come on, no Barbie Food TV kit, or Wii cooking game, can possibly beat the Easy-Bake Oven and Snoopy Sno-Cone Machine. Both of which are still kickin', thankyewverymuch. 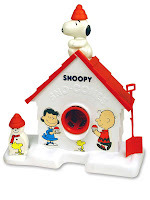 i so wanted one of these and an electric snoopy toothbrush to fight the cavities all that sugar cauesd. ha!